There are writers I enjoy and then there are writers that draw me into a world that feel more real than my own and speak to things that I struggle to express. Anne Rice is one of the latter. So, when the opportunity to hit my grandmother’s local library came up last week, I grabbed the sequel to Wolf Gift, a novel of hers I thoroughly enjoyed about two years ago and read it in about twenty hours, after hitting publish on Skere. I needed the break and I wanted to experience someone else ‘cooking dinner’ so to speak. It was everything I’ve come to love about Anne Rice’s work, with an added level appreciation that’s come to me since I’ve followed her on Twitter and started reading her thoughts on life, religion, and philosophy in general. Very quickly and carefully so as not to spoil anything, here’s an introduction to “The Wolves of Midwinter”. Reuben, a man who was given the Chrism in the prequel, “Wolf Gift”, is now finding his place in his new family, as a a Morphenkinder, a nearly immortal creature who hunts evil in the form of a wolf. The season is Yuletide and Nideck, the village near Reuben’s inherited house, is about to experience it has it had not been experienced in California before. I enjoyed this book for its unapologetic wallowing in the sacredness of the Yuletide season, its fascination and respect for the Yuletide and Christmas traditions even as it tacked and turned in the wind on the validity of the dogma behind those traditions. The entire narrative was unabashed in its embrace of family, in its various, messy, inescapable and inexplicable forms. The link between Christian holy days and pagan celebration days has fascinated me for year. Considering that I read this book on the eve of Easter, alternatively called Resurrection Sunday or Pascha in non-English speaking parts of the world, it seemed especially relevant. It always made me wonder, as a child, why Easter was called Easter. The word has nothing obvious to do with Christ coming back from the dead. It does, actually. 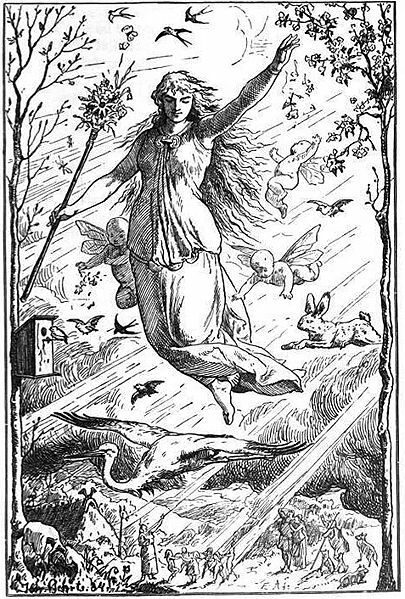 Easter comes from the name of the Anglo-Saxon dawn goddess, Eastre or Eostre, who herself seems to be a directive of a widely known Indo-European dawn goddess. Dawn and rebirth, or a return to life does seem pretty obvious. How far and how little we have traveled from our pagan roots! For me, there has often been conflict between these pagan roots and symbolic passages of time and how religions that trace their origins back to the Old and New Testaments treat the same days and ideas. My favorite part of “Wolves of Midwinter” was Anne’s wonderfully gentle and informed handling of these questions. I can read the book as a simple adventurer and love it for it’s quirky and adorable characters and entrancing plot but I also can read it as a thinker and student of humanity and find much in these pages to occupy my mind. Lastly, I also appreciated the gracefully handling of relationships, both traditional and nontraditional and the grace that was written into the narrative towards each one of the many represented. To truly enjoy “Wolves of Midwinter” I suggest reading “Wolf Gift” first. It is less philosophical, but as always with Anne Rice’s work, comes in the carriage ofa a very strong plot and a beautifully worked cast of characters. This entry was posted in Book Reviews, Mythology and tagged Anne Rice, Christmas, pagan roots in Christianity, paganism, werewolves, Yuletide. Bookmark the permalink. That’s interesting about the origin of the word “Easter”. I wonder if Easter in French – Pasques – is related to Pascha, and what the pagan roots of that word is.